It's hard to believe it's already December 1st! Time is just flying by! I never did set out with a "plan" when I started this Holiday Cardmaking Series - I never decided on a set amount of videos and still am not sure how many more I'll post. I do have a few more card ideas in mind so I hope to make and post at least a couple more videos over the next few days so we'll see what happens. Of course I had to pull out my Fluffles Christmas stamps - Fluffles is one of my all-time favorite line of stamps. I'm not even a big cat person but I love Fluffles. He's just too cute not to love *wink*. I had a client that was too sick to make their appointment so I was able to get this video edited and uploaded! Oh there's so much blog-goodness going on here at Prairie Paper & Ink right now!! I have a SNEAK PEEK post that went up late last night (that includes blog candy!) which you can see HERE. I've also got my ATS Gift Certificate giveaway going on HERE. And my ATG giveaway going on HERE. Make sure to check all that out because all these giveaways end on Oct 31/2010!! I love this Fluffles Musketeer image - it just cracks me up LOL! I colored him with my Koh-i-noor colored pencils and OMS. Then when I made the card I added some Lavender Stickles to his hat brim and sword handle, and added a tiny bit of Silver Stickles to the sword itself. I used my new MFT Star Border die with black cardstock and added Black Diamond Stickles to it to make it all sparkly. 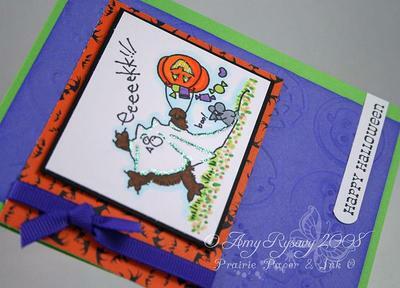 The 'Trick or Treat' is from the Spooky Sentiments set. I stamped it onto patterned paper then cut it out with one of my Labels 3 dies. I used more patterned paper on the inside of the card (all from the MME BOO to You collection) and stamped Fluffles Musketeer onto some white cardstock with purple ink before using my Label 3 dies again. And then to finish it all off I used another sentiment from the Spooky Sentiments set - I thought it fit rather well with this card LOL! I love Halloween - don't know why but I do! I used my new Making Memories Toil & Trouble patterned papers on the card, along with sentiments from my Spooky Sentiments set. I used one of my SU punches to punch out the "Witching you...", and the ribbon is May Arts. I colored in this Fluffles stamp last year (yes I said last YEAR). I had stamped out several Halloween images and had taken them to work with me to color in when I had time between clients. I never got a chance to make any cards with the images so I saved them. And then of course I totally forgot about them and just came across them the other day when I was organizing some cardstock. I used Kooh-i-noor pencils and Gamsol (artist-grade odorless mineral spirits) to color in the image. Then when I made this card I added Stickles to bling it up again. On the inside of the card I added more patterned paper, and edged both sides of the black cardstock with the MS Spiderweb punch. On the white cardstock I stamped the Fluffles image with purple ink then stamped another sentiment from the Spooky Sentiments set onto the olive cardstock before adhering it and that was it! This has to be a super-fast post as I need to get to work! Thanks for all the comments and well-wishes for my mom in my last post. She went to a specialist yesterday about her foot and is supposed to get surgery sometime within the next week (I had a feeling it would come to that as I knew it was more than just a break - it looked like some of her toes were crushed - OW I know!!) - so we'll see how that all goes. Anywho I actually have a card to share - sorry the pics aren't the greatest and I never got a chance to finish the inside - no time! I just used one of the Fluffles images that I had colored in at work a couple of weeks ago (ugh I have a BUNCH of Halloween images all colored and had all these plans of posting a bunch of cards using them and it looks like Halloween is going to get here before I can post even half of them!! :o( ). FYI it's actually the countdown and sneak peeks to All That Scrap's November release - you can check out all of that HERE <-----click! I haven't had a chance to make any samples for it yet (even tho I've got a set coming out as well!) - I started making a card or two and I think the stress was just getting to me b/c I just butchered it - it looked AWFUL so I threw it out! Depending on how the next couple of days go I may be able to squeeze in a little stamping (aka ME) time and get some sneak peeks and whatnot up on here. Fluffles Brew image colored in with my Koh-i-noor pencils blended with Gamsol. Sentiment is from the Spooky Sentiments set (punched out with a SU! punch). Drippy Goo punch by Martha Stewart used on the green cardstock and covered with Lime Ice Stickles for da bling! Patterned paper and brads are from Basic Grey's Eerie collection. Gotta jet - talk to y'all later!! I made this last night with one of the Fluffles images that I had colored at work. I wasn't really feeling it and things just weren't working like they were supposed to! I wasn't going to even post it but I've got nothing else to share right now - I am really not happy with how it all turned out. The saving grace is Fluffles of course - he's just so darn cute!!! I colored him in to look like our cat - I've even got that little "m" above his eyes LOL. I used my kooh-i-noor pencils with odorless mineral spirits and blending stumps to do all the coloring. When I put the card together I had a container of Flower Soft Autumn sitting on my desk so I added some of that for fun and it's one of the things I'm regretting now. I like the look of it (it's pretty cool stuff!) but it covered up the leaves too much and now y'all can't see how awesome I did coloring them LOL!! All the branches were cut from cardstock with SU! 's Little Leaves die then glued into place. Oh and the patterned paper is from Basic Grey's new Indian Summer paper pad (mebbe that's why I'm grouchy and really not diggin' the card - the weather here is STILL cold - it snowed all weekend (tho not much left on the ground thank goodness!) and it feels like WINTER! I have my fingers crossed that we get some nice fall weather - an indian summer would be fabulous!). I don't mind snow - but I was hoping it would hold off 'till December at least! Major wishful thinking on my part as we usually have snow on the ground by Halloween. I'm not ready for winter!! And on an un-related note - I have a TON of e-mails and messages, YouTube messages etc etc etc - most of them related to Copic markers - the majority of THOSE asking about what colors would I recommend to start with etc?? At this point I'm either going to try and either do a video response or a post on here to address all of it at once b/c I just can't respond to every one otherwise I'd be sitting at the computer all day every day! Speaking of which I need to get this post done ASAP. My mom called and I need to go in and work at the coffee shop for a few hours b/c one of the employees called in sick. I had stamped out all the Halloween and Fall Fluffles images that I own and have been coloring them in during my spare time when I'm at work and between clients. I got a few done so here's the first card made using this Fluffles Ghostie image. I used my koh-i-noor pencils and odorless mineral spirits with blending stumps to color the image in. I then die cut it and sponged all the edges. All the patterned paper is from the new Basic Grey Eerie collection - another new thing that I got recently (I went a little nuts and placed like 3 orders in a row and had a lot of fun when all the boxes arrived - and most of it is STILL sitting in a box here in my studio!! I'm starting to chip away at it and use it these papers being some of it). I used the latest Friday Sketch (by the fabulous Tammy!) for this card. I die-cut some circles from the patterned paper and solid cardstock. 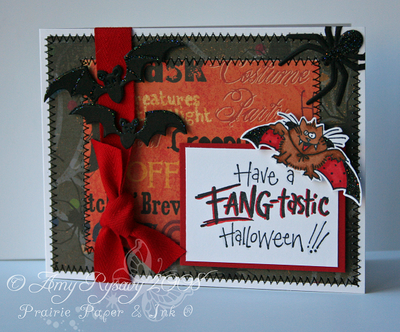 The "Happy Fright Night" sentiment is from my Spooky Sentiments set (I thought it was rather fitting for this Fluffles LOL). The inside sentiment is from my Autumn Sentiments set. The die cuts on the inside were done with the Nestabilities Labels 4 dies. Anyone seen my crochet hooks? I'm pretty sure they're in the garage with the tons off stuff I just put in there when we moved - Tim's been after me for months to get it all organized - but it's COLD!!! The garage isn't heated and just hunting for a good 20 minutes yesterday in there nearly gave me frostbite. All that stuff will have to wait for spring. I just love this Fluffles stamp - is it not the cutest thing ever??? This card was one of the other ideas I had when I posted my Friday Sketch! #46 - this time using a stamped image as one of the main "hearts". I stamped the image onto white cardstock then colored it in with my Prismacolor pencils and gamsol - thought I would use something other than Copics for once! Plus I wanted a softer-looking image than I can get with my Copics (right now anyway - I know there are some people that can get some pretty fantastic results with their Copics - I'm not one of them!). After the image was colored I cut it out with one of my circle nestability dies. The patterned paper is from a retired KI Memories wedding-theme collection. I used the patterned cardstock for the card base, added the layers (one punch with a Martha Stewart flower border punch) and pierced a heart on the one side (to do that I traced a heart outline from a heart nestability die with a pencil, pierced the holes then erased the pencil). The pink heart was die cut, then covered with Cotton Candy Stickles - this stuff isn't really "sparkly" but I LOVE the color and it adds such a neat texture. The flower centers areOYSTER baubles from Stamping Bella - I attached them with mini glue dots. 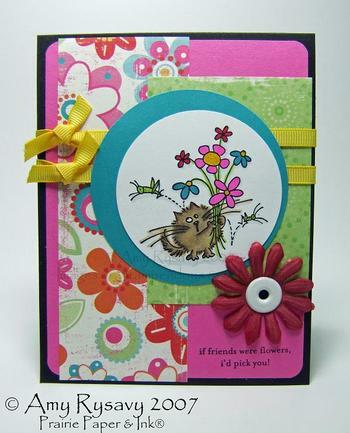 The "To have and to hold..." sentiment is from my Love Sentiments set (SO perfect for this Fluffles image LOL!). On the inside of the card I added some patterned paper and CS, die cut a white circle and off set it in the top right corner - opposite to the main image on the card front. I cut out another pink heart and covered it with Cotton Candy Stickles, let it dry then adhered it to the inside and that was it! STAMPS: Fluffles Love, AmyR Stamps Love Sentiments set. CS: KI Memories Wedding Patterned Paper (discontinued), White, Pink. ACCESSORIES: Nestabilities Dies (Circles, Hearts, Scalloped Hearts), Martha Stewart Border Punch, Ribbon, Primas, Bella Baubles, Cotton Candy Stickles, Dimensionals. OK I'm off to work some more on my studio. Painting is nearly done (I took an old mirror off the back of the door to discover that it had been painted around - so I've had to paint that and the closet door - such boring work but it needs to be done!) then I have to get shelves installed in the closet. I'm hoping I can have everything in by this weekend but we'll see what happens! Love is in the Air Fluffles!! What a non-productive morning I've had. I've been on my computer for HOURS attempting to install a printer with no luck (I've had issues with the disc, the company sent me out a new one more than once, I attempted to install it on our other computer and ran into problems, now I'm back to square one!!). I've also been going through the folders and files deleting things that don't need to be there, deleting duplicate pics, then getting sidetracked with some old pictures and videos when the girls were little (that wasn't a waste of time - it was so funny watching the videos again - they grow up way too soon!!). ANYWHO I am definitely tired of being on the computer so here will be a quick post before I go get lunch ready and go do something else! This is a 4.25" square card - it's been a while since I've made a card other than the standard A2 size. I stamped the image onto white cardstock before cutting it out with a Nestabilities circle die. I used these Copics to color him in - quite a few for such a simple image but I've been working more on blending and whatnot and an image like this is a good one to practice with (for me anyway). The glittered heart was cut with a scalloped Nestabilitie die from DoodleBug Sugarcoated (aka glitter) cardstock (you can get a similar look by using cardstock, versamark and Stampin' Up! Iridescent Ice embossing powder - but having the CS already glittered is much less work!). I added Fruit Punch Stickles to the hears of the image, and some fun flock with the Quickie Glue Pen to Fluffles to make him fuzzy. I also sponged on some ink to the edges before I adhered the image to the card with dimensionals. The inside was lined with the same pink DoodleBug textured CS (I love this CS - especially this pink - I've been using it a lot lately! I cut a circle from white CS with a larger nestie die, adhered that then adding a strip of the same patterned paper I used on the front (from the My Mind's Eye Irresistible line). I cut another small scalloped heart from a scrap of the glittered CS then adhered it to finish off the inside. CS: White, DoodleBug Pink, DoodleBug SugarCoated Red, SU! Baja Breeze. INK: Memento Tuxedo Black, Copic Markers, Palette blue ink. ACCESSORIES: Paper Piercer, White Gel Pen (ranger), Spellbinders Nestabilities Dies (circles and scalloped hearts), Stickles, Primas, Brads, Dimensionals, Fun Flock. Today's ATS Challenge is to use brads on your creation - check out the Design Team samples for it here. I'm taking suggestions for tutorials and/or tool product reviews - you can leave your comments for that on this post here. WOW. I know I said I would be back later in the afternoon on Friday with my Friday Sketch but man oh man was this weekend ever INSANE!! Today is officially Thanksgiving for us here in Canada so Happy Thanksgiving to all my Canadian readers!! My very first apple pie :o) Actually it's a Sour Cream Apple Pie. I know it's not the smartest thing to bake and serve something you've NEVER done before - but I HAD to make this pie and thank goodness it turned out PERFECT! Everyone loved it and there was not a crumb left. 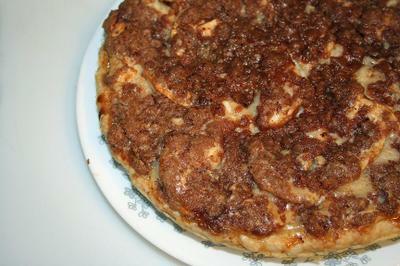 If you're interested in the recipe you can find it here on Posie Gets Cozy - I love her blog. I read it all the time and have never tried any of the recipes she's shared but this one I had to and it was SO good - I'll definitely be making it again! Anywho it was a long and busy weekend. We had my brother-in-law and his wife and new baby (3 weeks old!) staying here all weekend, Thanksgiving lunch and supper at the in-laws yesterday (I am so full of turkey now I think I will burst!) and brunch this morning. Needless to say it was a GOOD weekend just a long and tiring one! So of course for my belated Friday Sketch I had to use my Fluffles Turkey stamp. I cut an oval with my Nestabilities die and my CuttleBug then stamped the fluffles image, colored it in with my Copics, then masked the bottom and stamped A Muse's Small oval stamp to ground the image. I then replaced the Nestabilities die on the oval and airbrushed with a creamy colored marker (sorry I forget which one!) around the image (I didn't bother masking the image - just went in with a little color at a time with the airbrush and it was good to go) to make it stand out more. I used the Autumn Type Cuttle Bug folder on the Olive cardstock (misting the CS with water first using a Mini Mister - makes it much crisper embossed impression and no cracking!! ), some Chatterbox paper (that I've had forever - it's probably not available anymore), May Arts ribbon and DoodleBug brads. If you upload your card using this sketch to any public galleries please use the keyword AMYRS41 to make it easier to find. My camera battery died last night so this post is a little later than I intended!! First off did y'all see all the new stamps are now for sale at CC Designs? Plus they got a TON of new product in - I've been making up wishlists LOL!! OK on to the card. I mentioned recently that I have a "thing" for Fluffles stamps - and several people were surprised as I rarely make any cards with them!! That's true tho - I rarely had the TIME to make any cards with them. But now I do - so y'all will be seeing a lot more Fluffles cards on here *grin*. I used my new Fluffles Brew stamp for this card, stamping it onto white cardstock, masking the bottom then stamping an oval from A Muse to ground the image. I used Copoics to color in the image, added Grape Ice Stickles to his hat, and covered the cauldron with my Sakura Clear Glaze pen (it gives it a rather matte/shiny finish - not shiny like Ranger Glossy Accents or SU Crystal Effects - but I prefer the pen as it dries a LOT faster than either of those products). The patterned paper is KI Memories Haunted (ATS only has a limited supply of a few of the papers left - it's been discontinued!! :( I REALLY hope KI comes out with a new Halloween collection before next year's as this is my FAVORITE H'ween paper!!! I've been using it for a couple of years now and am running out of what I do have - blah). Anyway I finished off the card with some ribbon, buttons and stamped the sentiment at the bottom and that was it! Now I have to run and shower and get ready as we're all going to the Elementary school for lunch - Veronica's class is having a medieval feast and according to her we're all "wearing crowns and get to be princesses - daddy gets to be a princess too!!" (LOL). hehehehehehe this Fluffles stamp cracks me up (well they all do really) - he's such a riot. The sentiment is a separate stamp - I got them both at ATS as soon as they came in (of course) and inked them up last night and made this card. After stamping the sentiment I added the red with a Copic marker. Fluffles was stamped then colored with Copics and cut out then adhered to the card with dimensionals. The patterned paper is from Flair Designs Spellbound collection - I stitched it to the card with my sewing machine. The bats and spider were made with my new CuttleBug 3x3 Creepy Combo - those little sets are cool! I used the die and it cut out all three, then slipped the 3 pieces into the embossing folder and ran that through and it dry embossed them so the images just pop - very cool! 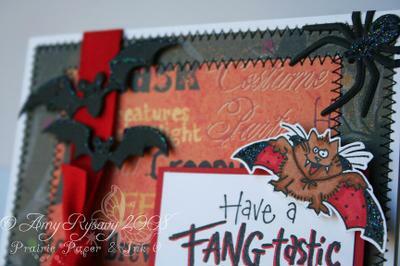 I added Black Diamond Stickles to the bats, the Spider and Fluffles cape to finish off the card and that was it! EDITED TO ADD: To answer a question no I don't have any problems with the black stickles - mine isn't thicker than any of the other stickles - but being black I tend to apply it in one spot then spread it around with the tip of the bottle to where I want it. And I do use less of it then other colors when I'm covering areas like this. I made this card yesterday when I made my Friday Sketch card - with this one I omitted the flower and put the sentiment on the other side - but still followed the sketch for the most part. I used my Copics to color in the image then added Crystal Stickles to the ghost outfit and the pumpkin. I used my Cuttlebug and the Boo to You embossing folder on the purple cardstock and sponged purple ink on it here and there to make the embossing pop a little more. The orange batty patterned paper is from SU! 's Halloween papers, the sentiment is from A Muse, brads are Doodlebug, and the ribbon is SU as well. I was going through my computer files and came across this card and realized I never did upload it on here! This card uses Fluffles Grasshopper stamp, I colored it in with a mix of Prismacolor Pencils and Gamsol and Copic Markers. The sentiment is from A Muse. The patterned paper is from Junkitz Salsa Celebration, the flower is a Bazzill Blossom (I colored it with a Copic Marker to get it the color I wanted), and the ribbon is Stampin`Up! (retired). 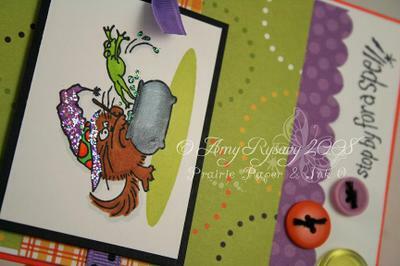 STAMPS: Fluffles Grasshopper by Stampendous, Sentiment by A Muse. CS: Papertrey White, Taken with Teal, Pink Passion, Black (Stampin`Up! ), Junkitz Salsa Celebration Patterned Paper. INK: Brilliance Graphite Black, Copic Markers. ACCESSORIES: Marvy Mega and Giga Circle Punches, Ribbon, Prismacolor Pencils, Gamsol, Bazzill Bitty Blossom, WeR Jumbo Eyelet, Corner Rounder Punch. I've been asked these sketches are "AmyR originals" - yes they are! I made them up myself on my computer and if you click on them to get a larger image you'll see my watermark on them as well. I've also been asked if it's OK for people to save the sketches onto their computer to use for inspiration -that's totally fine with me! All I ask is that if YOU also post your creations online and use one of my sketches - that you post a link back to me here (preferably right to the post that has the same sketch just to make things easier!). And I also would like it if you'd leave a comment on here when you do upload with a link to your creation b/c I'd like to see what you made! EDITED TO ADD: I've uploaded all the sketches I've made so far into their own gallery - you can see them all HERE <-------click! and I will continue to update the gallery as I post new sketches. I am really enjoying making up these sketches as I go along - so far I just have the basics down but I hope to be able to do more fun ones (IE more detailed and whatnot) down the road once I figure out how LOL!! I have also been thinking of setting aside a certain day each week to share a sketch instead of just posting one whenever I feel like it. I haven't decided which day tho! Any suggestions? ?